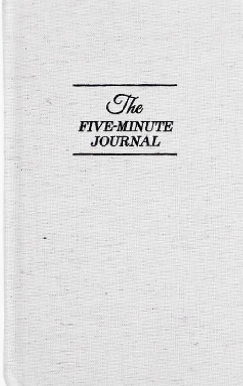 A couple of months ago, I was introduced to The Five-Minute Journal. As the name implies, the journal calls for brief entries (two per day: morning and night), nothing more than quick, bullet-item lists. In the morning, you jot down what you’re grateful for and what would make the day a positive one. You also list a couple of things you like about yourself. Come nighttime, you note what went well during the day and a couple of things you could have done to make the day a better one. It’s easy and doesn’t require much time to complete the prompts, so for those who struggle with journaling, the task doesn’t feel too daunting. It encourages a focus on gratitude and positive intention setting, both of which can impact your outlook and functioning. It forces you to name your strengths in a culture that so often suggests you focus on your weaknesses. It encourages you to take personal responsibility for making your days more positive. The journal prompts have a way of infiltrating your daily consciousness, impacting thoughts and actions so that they are more consistent with your values. If these exercises interest you, you can purchase The Five Minute Journal here. Otherwise, you can complete the prompts on your own. Notice any changes in thinking, behavior, or emotional patterns over time. Let us know what you think!